Organic peach fruit spread; non-sugar. 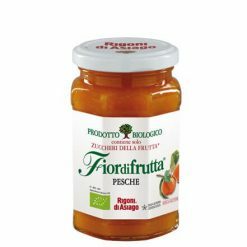 Made from organic Fayette peaches, concentrated organic apple juice and citrus pectin, this spread is delicious on bread or with yoghurt. It is also great in tarts and cakes, and is a perfect accompaniment to ricotta and mascarpone cheeses.